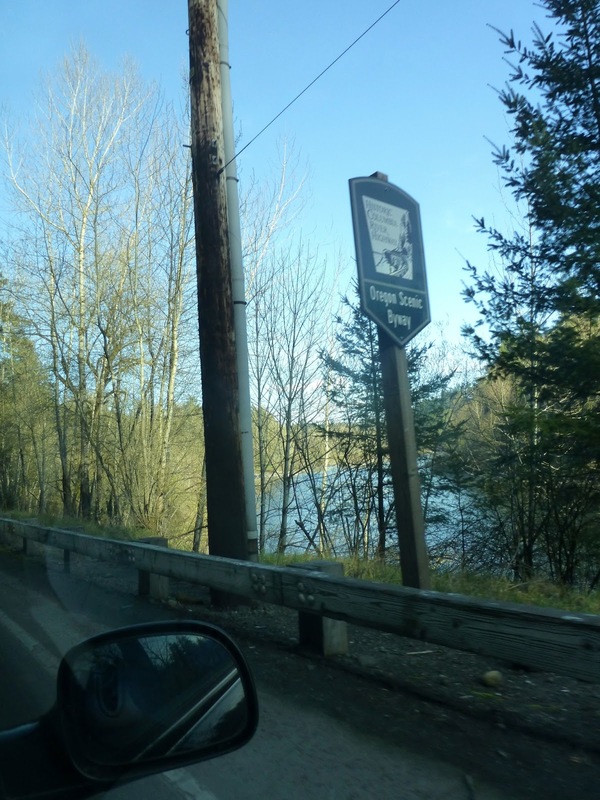 Soon after I moved to the Portland, Oregon area six years ago, my oldest daughter told me I would love eating at Tad's Chickin'N Dumplin's restaurant located on the bank of the Sandy River. It took me six years to test her opinion, but she was sooooo right! This past weekend my youngest daughter and I were able to eat there and we both loved Tad's and want to go back many times. The first photo of Mt. Hood with a weeping cherry[?] tree in the foreground was taken from a spot along Lusted Road near our house. To get to Tad's I accidentally took a detour by turning the wrong direction on the Historic Columbia Highway. My youngest daughter took a picture of a highway sign that features Teresa Kasner's sketch of the Columbia River Gorge. Teresa has several wonderful posts about her visits to Tad's that also encouraged me to want to visit Tad's myself. My youngest daughter and I ended up stopping at the Women's Forum Overlook to call Tad's and figure out where it was from where we were :) So while we were at the Overlook we had to take some photos of the snow on the mountains of Washington on the north side of the Columbia. 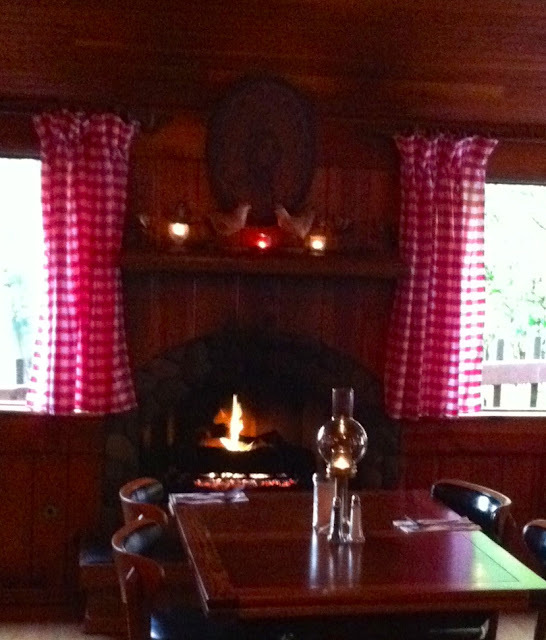 When we finally made it to Tad's we easily found parking, were welcomed into the rustic country setting by top notch staff and were graciously led to a riverside table we requested. While the menu is varied, we opted for forms of chicken for our first meal at Tad's. My daughter ordered Tad's famous chicken and dumplings and I had a broiled chicken breast with a baked potato. First we were served Portland made Thomas Kemper Ginger Ale, which has a lovely hint of honey with the ginger flavor. We were given a relish tray of fresh vegetables, then beautiful salads, then our entres with green beans and bread. The portions were so generous we took home lots of leftovers so that we could have a scoop of ice cream or sorbet. It was a deliciously memorable meal in an equally beautiful and memorable location. What a lovely way to spend a day with your daughter, I just spent the day with my mum. The food a place sounds great. I have never been there Gracie! But hopefully I'll get to go some time soon. I'm sure you had a wonderful time with yr daughter. It's so nice that u have family so close! I hope you are having a wonderful Spring break. I thoroughly enjoyed this post!!! The food, the scenery....my goodness....it makes me want to move to Oregon!! Sounds like a wonderful day out with your daughter! How lucky you are to live in such a beautiful area. And to have a nice adventure with your daughter. Gracie, I swear you and Teresa make me so hungry posting about all these wonderful places to eat. It looks like you had a beautiful and yummy day. Oh Gracie! Such beautiful, beautiful pictures you took. And what a fun post. The food looks delicious too. I really enjoyed the trip to Tad's. Maybe I'll make it there sometime. And to get a picture of Teresa's sign-very thoughtful of you. Thanks for taking us with you. And now I'm hungry! Your question, do I have a favourite restaurant, makes me realise that it's been a very long time since I went to a restaurant for a meal. But I have a few favourite coffee shops and tea rooms! The Victoria Restaurant is where my daughter and I used to go for a slice of Victoria sponge after school sometimes, and we will return there for sure before we leave Aberdeen. Maybe I should do a post about it! What a great little spot and a fun sign. Looks like things are very springy in the Portland area. I think I am hungry again...YUM! I LOVE these photos of your travels! The mountains, the nature, the food, the friends. They're all just so fresh! Can't pick a favorite this time...though I'm thinking if you made me, that pink ice cream-looking dish would have to be the one based on content alone, lol! I think my favorite restaurant has closed and reopened to become a new one that I haven't tried yet. But it used to be called Horizons in PA.